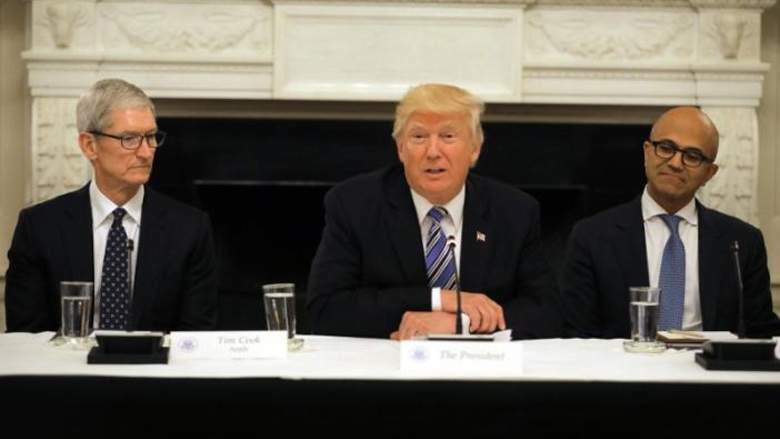 President Donald Trump met on Monday with the heads of 18 US technology companies including Apple Inc, Amazon.com and Microsoft Corp, seeking their help to make the government's computing systems more efficient. The White House wants to update government information technology systems, cut costs, eliminate waste and improve service. Trump on Monday cited estimates that the government could save up to $1 trillion over 10 years through such measures. "Our goal is to lead a sweeping transformation of the federal government's technology that will deliver dramatically better services for citizens," Trump said. "Government needs to catch up with the technology revolution." The executives are part of the so-called American Technology Council that Trump formed in May to support efforts to modernize the U.S. government. "The US should have the most modern government in the world. Today it doesn't," Apple Chief Executive Officer Tim Cook said. Amazon Chief Executive Officer Jeff Bezos said he wanted the Trump administration to make use of commercially available technologies, worker retraining, machine learning and artificial intelligence. Before meeting with Trump, the CEOs met in 10 small group sessions with Vice President Mike Pence, Treasury Secretary Steve Mnuchin and Commerce Secretary Wilbur Ross, along with the presidents of the Massachusetts Institute of Technology and Ohio State University. Jared Kushner, Trump's son-in-law and adviser, said the administration wanted to "unleash the creativity of the private sector to provide citizen services in a way that has never happened before." He said the administration was scrapping unneeded regulations for government computing systems, such as a rule on preventing Y2K issues. Most of the government's 6,100 data centers can be consolidated and moved to a cloud-based storage system. The White House is seeking to shrink government, reduce the federal workforce and eliminate regulations. Trump in March signed an order to overhaul the federal government and tapped Kushner to lead a White House Office of American Innovation to leverage business ideas and potentially privatize some government functions. Many of the tech executives are eager to get White House help in dealing with regulatory and other policy issues such as visas for highly skilled workers. Others attending include Alphabet Inc Executive Chairman Eric Schmidt, venture capital firm Kleiner Perkins Chairman John Doerr and the CEOs of Microsoft Corp, International Business Machines Corp, Intel Corp, Qualcomm Inc, Oracle Corp and Adobe Systems Inc, Facebook CEO Mark Zuckerberg was invited but could not attend because of a conflict, the company said. A 2016 US Government Accountability Office report estimated the US government spent more than $80 billion in IT annually, excluding classified operations. In 2015, the U.S. government made at least 7,000 separate IT investments and some agencies were using systems that had components at least 50 years old. "This structure is unsustainable," Kushner said. The CEOs and White House also planned to discuss Trump's review announced in April of the U.S. visa program for bringing high-skilled foreign workers into the country. Cook plans to raise immigration, a person briefed on the matter said Sunday. The council also seeks to boost the security of US government IT systems and wants to learn from private-sector practices. In 2015, hackers exposed the personal information of 22 million people from U.S. government databases. The White House thinks it can learn from credit card companies about significantly reducing fraud. A 2016 government audit found that in Medicaid alone there was $29 billion in fraud in a single year. Following Trump's June 1 decision to withdraw from the Paris climate accords, Tesla CEO Elon Musk and Walt Disney CEO Robert Iger stepped down from White House advisory panels. White House officials said the dispute had little impact and that they had to turn away tech leaders from Monday's event because of lack of space.